afrol News - South Africa "cradle of human culture"
� 29.03.2010 - Racist song "part of South Africa's heritage"
South Africa "cradle of human culture"
The perforations of these Nassarius shells found at Blombos Cave show wear marks, indicating they were used as beads, according to Mr Henshilwood. afrol News, 20 April - Archaeologists are astonished at the a record-breaking finding at the Blombos Cave, near Cape town in South Africa. 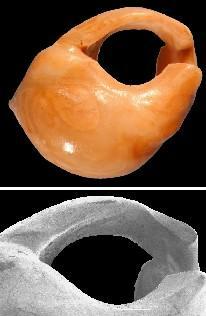 75,000 years old beads found here are the oldest evidence of "modern" cultural expressions among humans ever studied. The ornamented shells are 30,000 years older than any other known "critical modern behaviours" found at other sites, making South Africa the cradle of human culture. - This bead represents new proof that 'modern' man first lived in Africa, comments archaeologist Chris Henshilwood, programme director of the Blombos Cave Project and professor at the Centre for Development Studies of the University of Bergen, Norway's second city. "The Blombos Cave beads present absolute evidence for perhaps the earliest storage of information outside the human brain," he adds. The perforated shells found at South Africa's Blombos Cave appear to have been strung as beads about 75,000 years ago - making them 30,000 years older than any previously identified personal ornaments. Archaeologists excavating the site on the on the coast of the Indian Ocean discovered 41 shells, all with holes and wear marks in similar positions, in a layer of sediment deposited during the Middle Stone Age. The shells, found in clusters of up to 17 beads, are from a tiny mollusc scavenger, Nassarius kraussianus, which lives in estuaries. They must have been brought to the cave site from the nearest rivers, 20 kilometres east or west on the coast, the international scientists conclude. The shells appear to have been selected for size and deliberately perforated, suggesting they were made into beads at the site or before transport to the cave. Traces of red ochre indicate that either the shell beads themselves or the surfaces against which they were worn were coated with this widely used iron oxide pigment. -dominant theory of behavioural evolution, which held that humans were anatomically modern at least 160,000 years ago but didn't develop critical modern behaviours until some punctuating event 40,000 or 50,000 years ago. In South Africa, however, development was faster, the scientists demonstrate. Mr Henshilwood and his colleagues - including Francesco d'Errico and Marian Vanhaeren of the University of Bordeaux, France, and Karen van Niekerk of the University of Bergen - believe the Blombos bone tools and ochre show that modern behaviour like the use of external symbols developed gradually throughout the Middle Stone Age, not suddenly when our ancestors spread from Africa to Eurasia. Similar finds at other recently excavated African sites support their belief. Some critics have argued that those African artefacts did not represent true symbol use. The newly found beads however strengthen Mr Henshilwood's assertion considerably. According to the Bergen professor, "agreement is widespread that personal ornaments, such as beads, incontrovertibly represent symbolically mediated modern behaviour." 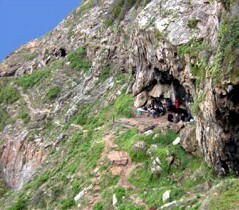 Humans occupied Blombos Cave, on the shore of the Indian Ocean, 75,000 years ago. Accumulated dune sand then closed off the cave. About 2,000 years ago, rising sea levels re-opened Blombos and humans returned. Blombos Cave contains artefacts from both the Middle and Later Stone Ages. The artefact-rich layers are clearly separated by a layer of dune sand deposited about 70,000 years ago. While Later Stone Ages strata, which are less than 2000 years old, also contain Nassarius shells, they are a different colour from those in the Middle Stone Ages strata. Also the Later Stone Ages shell sizes and the placement of the piercing differ from, and are less uniform than, the Middle Stone Ages shells. Mr Henshilwood and his co-workers conclude that ancient Africans deliberately selected the shells and modified them for use as beads at least 75,000 years ago. To Mr Henshilwood, this clearly indicates that the cave's early inhabitants used symbols in modern fashion. "Once symbolically mediated behaviour was adopted by our ancestors, it meant communication strategies rapidly shifted," he says, "leading to the transmission of individual and widely shared cultural values - traits that typify our own behaviour." The Blombos Cave is located in the nature reserve De Hoop, on the eastern coast of the Cape peninsula, only some four hours drive from Cape Town. 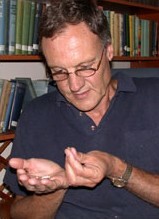 The wide-ranging excavations of the Blombos site have so far been funded by the South African National Research Foundation, the University of Bergen, the Paris-based Centre National de la Recherche Scientifique, the European Science Foundation, the US government's National Science Foundation, the Anglo Americans Chairman's Fund and the British Council.